But there are other events of genocide, attempted genocide, or the vague "acts of genocide" that the US President Clinton tried to parse during the Rwandan darkness in 1994. 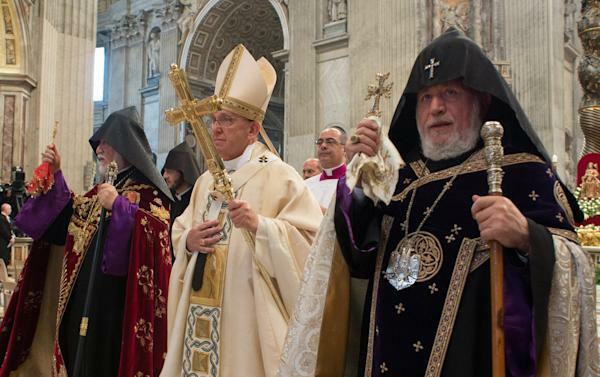 And unlike many nations who calculate their response carefully, Pope Francis this past week stormed the citadel of obfuscation and declared the massacre of Armenians during World War I as this past century's first genocide that should not be forgotten. From a CNN posting, ""In the past century, our human family has lived through three massive and unprecedented tragedies," the Pope said at a Mass at St. Peter's Basilica to commemorate the 100th anniversary of the Armenian massacres. "The first, which is widely considered 'the first genocide of the 20th century,' struck your own Armenian people," he said, referencing a 2001 declaration by Pope John Paul II and the head of the Armenian church. Pope Francis has made a number of utterances that have offended many. He has criticized growing economic inequality and unfettered markets; an excessively top-down Catholic Church hierarchy, asked for more tolerance of gays, turned away from the more lavish features of the papal lifestyle, washed the feet of convicts, has repeatedly called for greater efforts to lift up the world’s poor, denounced the killing and persecution of Christians in the past year, and said spanking children isn't all bad. For his troubles, nearly everyone is unhappy with something he has had words for, but also a bit more tuned in to what he might say next. Somewhat mystifyingly, Turkey's leadership today, under the somewhat erratic leadership of President Erdogan went "postal." As the Deutsch Welle news agency reported, "Turkish President Recep Tayyip Erdogan on Tuesday accused Pope Francis of spouting "nonsense" and warned the pontiff not to make "such a mistake again." "We will not allow historical incidents to be taken out of their genuine context and be used as a tool to campaign against our country," Erdogan said in his first reaction to the pope's comments. Not to be outdone, another "outraged" response came from Volkan Bozkir, Turkey’s minister for European affairs, who significantly upped the ante on his colleagues by suggesting that Argentines as a whole, and not just the pope, had been brainwashed by rich and powerful Armenians in their midst," so reports an article by the New York Times. Turkey recalled its ambassador to the Vatican. The bottom line response from Turkey's Erdogan is that criticism against his country is a form of hate speech.